Government reformers and advocates believe that two contemporary phenomena hold the potential to change how people engage with governments at all levels. The first is data. There is more of it than ever before and there are more effective tools for sharing it. This creates new service-delivery possibilities for government through use of data that government agencies themselves collect and generate. The second is public desire to make government more responsive, transparent and effective in serving citizens — an impulse driven by tight budgets and declining citizens’ trust in government. The upshot has been the appearance of a variety of “open data” and “open government” initiatives throughout the United States that try to use data as a lever to improve government performance and encourage warmer citizens’ attitudes toward government. The results cover all three levels of government in America — federal, state and local — and show that government data initiatives are in their early stages in the minds of most Americans. Generally, people are optimistic that these initiatives can make government more accountable; even though many are less sure open data will improve government performance. And government does touch people online, as evidenced by high levels of use of the internet for routine information applications. But most Americans have yet to delve too deeply into government data and its possibilities to closely monitor government performance. As open data and open government initiatives get underway, most Americans are still largely engaged in “e-Gov 1.0” online activities, with far fewer attuned to “Data-Gov 2.0” initiatives that involve agencies sharing data online for public use. 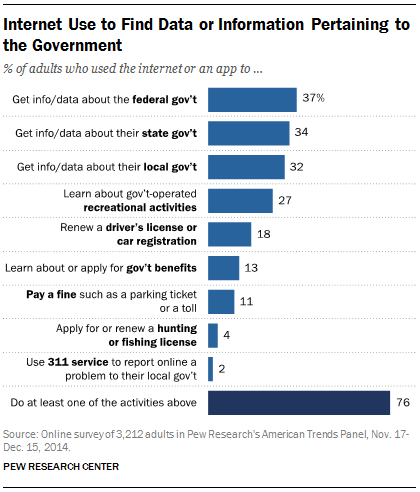 65% of Americans in the prior 12 months have used the internet to find data or information pertaining to government. In this early phase of the drive for open government and open data, people’s activities tend to be simple. Their connection to open data could be as routine as finding out the hours of a local park; or it could be transactional, such as paying a fine or renewing a license. Minorities of Americans say they pay a lot of attention to how governments share data with the public and relatively few say they are aware of examples where government has done a good (or bad) job sharing data. Less than one quarter use government data to monitor how government performs in several different domains. Just 5% say the federal government does this very effectively, with another 39% saying the federal government does this somewhat effectively. 5% say state governments share data very effectively, with another 44% saying somewhat effectively. 7% say local governments share data very effectively, with another 45% responding somewhat effectively. 19% of all Americans could think of an example where the local government did a good job providing information to the public about data it collects. 19% could think of an example where local government did not provide enough useful information about data and information to the public. 20% have used government sources to find information about student or teacher performance. 17% have used government sources to look for information on the performance of hospitals or health care providers. 7% have used government sources to find out about contracts between government agencies and outside firms. Americans have mixed hopes about government data initiatives. People see the potential in these initiatives as a force to improve government accountability. However, the jury is still out for many Americans as to whether government data initiatives will improve government performance. Proponents of open data hope that a variety of benefits might emerge from greater transparency about government activities, from more public accountability to better customer service. Majorities are hopeful that open data can help journalists cover government more thoroughly (56% do) and 53% say open data can make government officials more accountable. Combining those who respond affirmatively to these propositions means that 66% of Americans harbor hopes that open data will improve government accountability. When looking at government performance, however, people are less optimistic, with less than half of Americans saying open data can help the quality of government services or officials’ decisions. Additionally, 50% say they think the data the government provides to the public helps businesses create new products and services. People’s baseline level of trust in government strongly shapes how they view the possible impact of open data and open government initiatives on how government functions. 76% of those who generally trust the federal government say government data can help government officials be more accountable. 73% believe government data can help journalists cover government more thoroughly. 71% back the idea that government data results in better government decisions. 70% agree with the notion that government data can enable people to have a greater impact on government affairs. 69% say government data can improve the quality of government services. Americans’ perspectives on trusting government are shaped strongly by partisan affiliation, which in turn makes a difference in attitudes about the impacts of government data initiatives. Some 48% of this sample say they are Democrats or lean that way, while 41% identified as Republicans (or as leaning toward the Republican Party). Those with different partisan views have different notions about whether they trust government. Some 31% of those identifying as Democrats (or leaning that way) say they trust the federal government to do the right thing most of the time, compared with 15% of those identifying as Republicans (or leaning that way). Americans are for the most part comfortable with government sharing online data about their communities, although they sound cautionary notes when the data hits close to home. 82% of adults say they are comfortable with government sharing data online about the health and safety records of restaurants. 62% are okay with government sharing information about criminal records of individual citizens online. 60% can accept government sharing data about the performance of individual teachers at schools online. 54% are comfortable with government sharing data about real estate transactions online. Only 22% are comfortable with government sharing information about mortgages of individual homeowners online. Smartphone users have embraced information-gathering using mobile apps that rely on government data to function, but not many see a strong link between the underlying government data and economic value. One of the issues for proponents of open government and open data is whether people are aware that government data undergird key businesses. Perhaps the most prominent example is that government weather-related data are the foundation of large numbers of weather-forecasting companies and analysts. In addition, government-created geolocation data are often the centerpiece of Global Positioning Systems (GPS) that are widely used in smartphones and other location-tracking systems. 84% have used weather apps to find out the forecast nearby. 81% have used map apps to navigate through a city or neighborhood. 66% have used an app to find out about nearby stores, bars or restaurants. 31% have used apps to get information about public transportation. 14% have used apps such as Uber or Lyft to hire cars. Despite widespread use of commercial applications that rely on government data, just 9% (among all Americans) say that the data government shares with the public helps a lot with the private sector’s creation of new products and services, while another 41% says it helps somewhat. People’s outlooks about open data and open government sort into four distinct groups that depend on their engagement with government data and online applications, as well as their level of optimism about how government data initiatives might impact government. 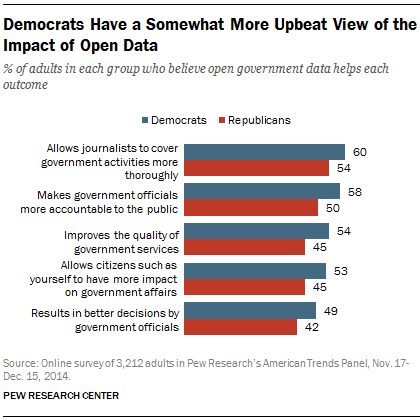 Some 17% of all adults — Ardent Optimists — have truly signed on to government data initiatives. They use online resources to connect with government and have strong levels of understanding about the details of government data. They are highly likely to think government data will improve how government performs, how citizens can impact government and how journalists can do their jobs. Another 20% are steady users of online government resources, but are skeptical that they will have any payoff to government performance. These Committed Cynics use the internet to find the government information they need and have relatively high levels of awareness of when governments do a good job sharing information about data. But a minority thinks government data will improve government services, decisions or their ability to impact the government. This group has low levels of trust in government. Some 27% like the idea that data can improve how government performs, but these Buoyant Bystanders are not likely to use the tools that the data enables to connect with government. Strong majorities think government data initiatives can foster greater government accountability and better government services. This group brings more trust in government to the table than other groups, but they do not often use the internet to get information about government or carry out transactions. Finally, 36% of the general population can be called Dormant Doubters. They do not often use the internet to transact or find out about government and they also do not think government data initiatives are apt to improve government services or make it more accountable. They have low levels of trust in government to begin with, which may influence their perspectives on whether data initiatives can improve government. For stakeholders hopeful that open data and open government can have an impact on the public’s view of government, these groupings put these hopes in the context of where people are today. A minority — 17% — see the potential clearly. A slightly greater number — 20% — are relatively familiar with government data initiatives, but remain wary that these initiatives will have much impact on government performance. Larger numbers offer a mix of encouragement and caution as to whether open data and open government could become more meaningful to them as these initiatives evolve. Some 27% of Buoyant Bystanders see the appeal, but for whatever reason do not use the tools of open data and open government that much. The Dormant Doubters (36%) are in the category whose future interest and inclinations are uncertain. To the degree they might ponder open-data initiatives, they seem to be wondering whether these initiatives can make a difference and are reluctant to start exploring something for which they see little potential impact. A potentially significant barrier to government data initiatives lies in the connection between trust in government and skepticism among some citizens about whether these initiatives will bolster government performance. The greater a person’s trust in government, the greater the likelihood she believes government data initiatives will improve government performance. That sets up a chicken-and-egg dilemma. Do government data initiatives spark high levels of trust in government? 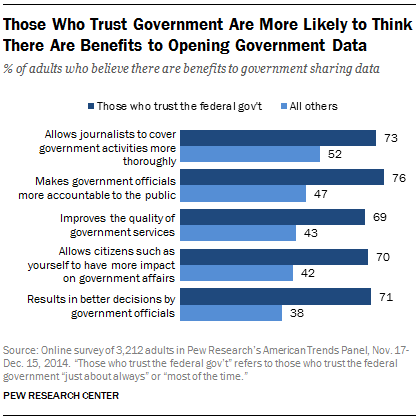 Or do low levels of trust in government attenuate the benefits to civic engagement that are a motive for many government data initiatives? In highlighting this dynamic, this research points to the challenges and possibilities in ongoing efforts in the open data and open government arena. The analysis in this report is based on findings from a nationally representative survey of 3,212 American adults (ages 18+) by the Pew Research Center on its American Trends Panel. It was fielded November 17-December 15, 2014. The survey was conducted in English and Spanish on the web and in postal mail. The margin of error for the full sample is plus or minus 2.0 percentage points.